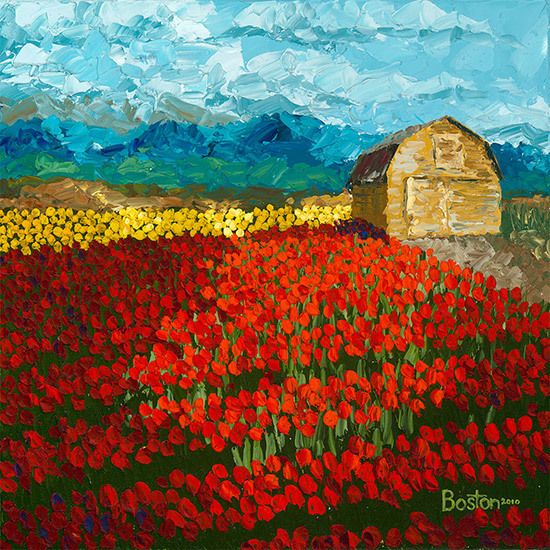 The original oil painting is painted on high-quality cotton canvas, 20″x20″. My palette knife impasto painting technique creates a lively textured surface, with really thick paint. The original comes already framed. The tulip fields of the Skagit Valley in Washington state are really amazing. I tried to capture that moment in time when we have our broken clouds, and there is that shot of bright color surrounded by the darker tones when the sun breaks through some of the clouds. My original custom giclée paper prints are produced on archival quality fine art papers that are 100% cotton, with a distinctive textured surface and heavy weight. Custom prints on canvas add an extra level of authenticity. I personally hand-retouch all my canvas prints with a special surface texture that adds additional gloss and recreates the texture present in the original oil painting back into the print. Other custom print options are also available. Contact me directly to discuss before purchasing! High-quality giclée prints on canvas and archival paper are available. Please contact the artist.